It’s that time again – time to ring in a New Year! And, this one for us is a snowy one! Setting goals for the New Year gives a chance to begin fresh with new ideas and motivation to carry through. Have you set goals for yourself and your family? For me, a new year offers hope and excitement. It is a new adventure waiting to happen! But, while I am waiting for the new adventures to happen, I have been thinking about setting goals and I want to share them with you – if I share them, I feel I will be held accountable and that helps motivate me – so, thanks in advance! In previous years I have done a read through the Bible in a year program. This program is from In Touch Ministry with Dr. Stanley. They offer a free magazine that contains not only encouraging and uplifting articles but also a daily devotion and read through the Bible in a year section. I really enjoy it. I will be studying the 30 Life Principles from Dr. Stanley this year. You can find articles on their website for each principle but within the Life Principle Study Bible each principle has a lesson complete with applications and Bible memory verses. I have found the life principles to be pertinent to my daily walk and am looking forward to digging deeper. As normally happens, December is the month I tend to loosen my standards on what I allow the family to eat. I know there are plenty of healthy dessert recipes floating around the blogosphere and I have lots of my own. But, during the holidays, family favorite recipes (cocoons, sugar cookies and angel wings) are a tradition and try as I might to make them more healthy, some things you just eat because they are good! So, since the holidays are over, it is time to practice healthy eating once again. To start off the year, we are doing a gut check – going through the Introduction for the GAPS diet as a family to make sure everyone has a gut populated with the beneficial bacteria. In preparation, I have jars of sauerkraut fermenting on my counter. From there I will be trying new recipes of traditionally prepared foods and sharing them with you! 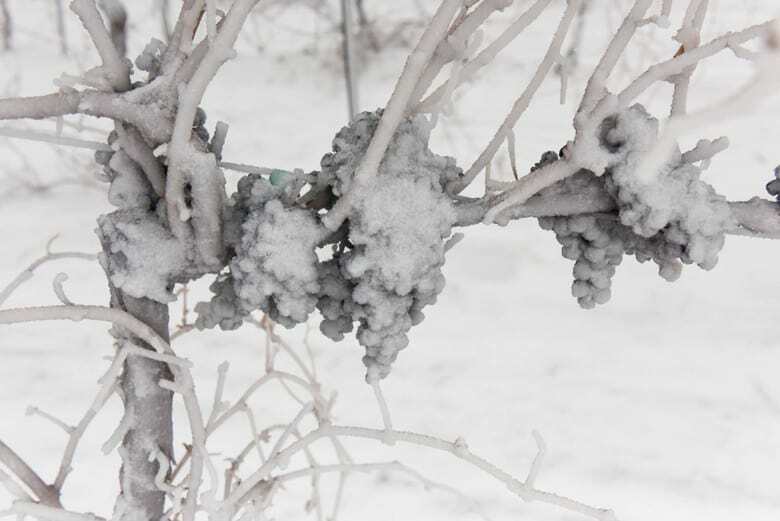 Before I go on the next goal, I want to show you what was found this morning in the vineyard – frozen, snow covered grapes! They are low hanging and were missed by the harvester but sure are pretty! Why does it seem that if I do not have time for something, it is exercise? After all, exercising and getting your heart rate up releases “happy hormones” that give an all around sense of well being! But, that is what gets booted from the schedule if time is short. But, not this year! I enjoy exercise and the way it makes me feel and my top picks that I will be doing this year are walking, jogging and biking. As weather permits, I enjoy walking around the vineyard. John and the boys keep a path mowed around what used to be a crop circle that the vineyard is in the middle of – once around is one mile so it is easy to keep up with my distance. When I cannot get outside, I enjoy Leslie Sansone’s walking videos – I have several of the four and five mile walks and like them all! I used to enjoy running but I have switched to jogging on a mini trampoline because not only is it easier on your joints, it also stimulates your lymph system. Plus, I can be in the house with the children to answer any questions about their schooling and monitor attitudes. I normally watch an old television show while jogging so the time flies! To add variety I will also be biking. Living in the country on a dirt road makes for a very bumpy ride so, I use my fluid trainer and have the bike set where I can see again, an old television program. As grape growers, we get paid once a year (after harvest) and that can make budgeting a challenge! Not only do we have living expenses but also the expenses of running a vineyard so, planning for those expenses is crucial. Believe me, I could run through the money if it were not for planning! I started something new in 2014 – keeping a spread sheet of each month’s expense categories all on one sheet so I could see easily the differences between the months. I have always kept a budget book in which I write down what is spent based on categories of spending but, easily being able to compare the months was huge for me! I will be working throughout the new year to be a better steward of the finances that the Lord has blessed us with. One area in which I have saved big time is through menu planning – I will be telling you more about that in the coming months. Cultured Palate is growing phenomenally and I am excited to see what the new year brings. In addition to launching the new website design I will also be launching my new ebook – Simple Cheesemaking! I have received many emails and questions about cheesemaking so hopefully, it will be ready within the next month. I also have a couple of other ebook ideas but I will keep them a secret for now! Another exciting addition to Cultured Palate will be a shopping cart – we will be offering hand painted ceramic tile murals from Spain! If you are new to Cultured Palate, in our former life, John was a chemist for a Swiss owned chemical company. We transferred and lived in Switzerland for four years and I did a lot of shopping. While there, we began an import business that we later closed when we began the vineyard. One of the products we imported were the murals and they are beautiful! In addition to fruits and flowers, there are many grape and vineyard themed murals! I am excited about the new adventures that this year holds and I look forward to hearing from you – what are your goals and resolutions for the New Year? In four exciting and frightening short months my husband is retiring from the Coast Guard! No more moving after this last one, we hope! It has been a long journey and very big new one is beginning for us. Waiting on the Lord to see what He has for us is a big challenge for me. I like to plan and have answers for everything right away. It cannot happen that way! Fitness goals: once I purchase a kettlebell (I already have the workout dvd) I want to begin to incorporate strength training into my exercise routine. Running is just not enough anymore (one more sign of getting older). I need to train for lifting all those boxes too. The life principle sounds neat and I will be looking into it. Thank you for the information and Happy New Year! Sarah, I will be praying for you as you undertake this year’s adventures! You have just reminded me, I also bought a kettlebell but shortly afterwards hurt my elbow – maybe I could use it now! Thanks for the reminder and Happy New Year! Happy New Year! Beautiful pictures and worthy goals! Enjoyed your post. Blessings to each of you! Thanks, Elise – Happy New Year!